So, here it is – almost June, with Beltane gone by so quickly, the Spring so strange, and all of my life in slow motion. What is this that happens, when your world is turned upside down and inside out, all of a moment and everything we think we know changes? I thought I knew, having been through a few of these events, in past. But new ones arrive and you are stricken again, all over again, like the very first time. I love Dylan Thomas, but I think he had this wrong. I recall all the recent shocks, starting with my brother’s death, and then Luke, and then my father, and last fall, the call from Saskatchewan that was not my partner of 25 years, but his uncle, telling me that Alex was in surgery, that he had a complicated appendicitis, that he would update me. And then the updates, making clearer and clearer that had the uncle not been there, to drag Alex to ER, he most certainly would have died. Two weeks in hospital, and then months of recovery, he did NOT lose his colon, but it was touch and go for a while. You think you get used to this – you go through it again and again, you rally, you deal with it in your own way, whatever way that is. And then the storm settles, and you think you are ok – again. I was ok last March, working on a course I am very proud of – coming to terms with the losses and struggles of last year, and then the gateway to Chaos opened again and there it was. So, as of March 9, I am basically homeless. My centre, my spiritual home, everything I have loved and tended and yes, struggled with for 11 years is about to be taken from me. I have been told my lease will not be renewed, and I’m not going into the details here. It is unjust, the worst possible timing but n amount of pleading will soften a heart that does not exist. Ok than! Let this be, yet another lesson. So – today. Is this a requiem or a door opening? Obviously, to me anyway,it is both. . As much as I have loved, written about, celebrated my geographical surroundings, there are many problems here. Some, drive me up the wall. Some are fixable, others are not. At the end of the day – this is not my property, and everyone who allows themself to fall in love with someone else’s home, runs the risk of suffering as I have this past 3 months. We run the risk of losing everything and at a moment’s notice. We invest in something that is never ours to invest in at all. We place ourselves at the mercy of others, whom we may not even know. I am, on one level completely devastated not only that we have to move, leave this enchanted place that is also the place I have lived longest, ever in my life – 11 years. I am, on one level, inconsolable. I awake with the dawn and watch the light outside, kiss the cedars and sing to the birds, who sing louder probably to stop my atonal noises. I feed the deer, the foxes and the squirrels, not t mention birds. Trumpetflower wraps the front porch,feeding the hummers, and a hundred times a year, I catch something wounded, bring it in and help it heal, release with a prayer of both blessing and gratitude. Both of my dogs died here, and I sat in this office for two weeks, waiting for news my father had died.I finished two diplomas and countless other courses on route to becoming the herbalist I like to think I am now. I watched both inside and out of this house crumble with neglect, and I thought, as recently as last month, about rallying everything that I can and buying it. But in the end, I could not save it, not as a rental, not as the sanctuary it has been for me despite all the problems. For weeks, I could barely function with sorrow and anxiety. But still…didn’t I mention something about…celebration…. It is 2 pm on a hazy late spring Monday and I have just come in from bringing water to the valerian and St.John’s wort, the two herbs I grow that are suffering the most in our extreme heat and lack of rain. To get to the garden I walk past a glory of lilacs, a rapidly blooming wild rose and underfoot is an unbelievably soft carpet of Ground Ivy, Mouse-ear Chickweed, Speedwell and Wild Strawberry. The lot is ringed with white pine, Northern white cedar, trembling aspen, wild cherry, balsam poplar, white spruce, several small ash trees, the two rowans I planted a few years ago in memory of my brother, and one corner features two apple trees and a struggling, but magical hawthorn. In that corner, a few years ago I started a fairy shrine – using a gorgeous triangular piece of quartz I found hiking nearby as a centerpiece, and adding incense, statues, crystal glasses filled with cream and honey and home made incense, year after year. And suddenly last year, a red elder popped up right behind the shrine. There is no red elder anywhere on this property or adjacent to it. I love that, and honestly could not ask for a more meaningful sign. Over the years here I have developed a deep relationship with several deer who visit in the autumn, I have walked out back to come face to face with a black wolf, staring me in the eye, and then walking slowly away.I have sheltered a small Saw-whet owl who took to my porch in deep winter and hunted voles under the thick snow, leaving me a bezoar when he departed.I have made medicines of all description from the wild plants here, learning their ways intimately, growing much more into my herbalism than in years past.I have learned a fierce independence that was not defiant or shrill, but simply my sanity asserting itself after years of bewildered longing. I have seen, finally, the shift in my consciousness I sought from an early age, looking for it at university and in Wiccan circles and in love relationships and in Jungian analysis and endless self examination (there it was, in nature, all along). I have put out a call for Motherwort and awakened to a yard completely covered with it (careful what you ask for, the Plant Kingdom has a sense of humour!) All of this and oh so much more, while watching the sun and moon change positions, all year, every year, watching sunrise over the ridge of wildwood out to the east and sunset over the winding stream,lined with hawthorn and white willow, just outside my front door. And all of this, I will carry with me to the new land, to the forest and streams and enchanted spaces that – this time – I will call my own, will build a permanent home and mark the quarters, build gardens everywhere, make magic in seclusion and safety and without the threat of suddenly, having my life ripped apart, on the whim of another. So, over the next year, as we seek our Home and prepare to leave this one, I’m planning a series of posts here about the trees, plants, bird and animals who have been so much a part of my life here, such teachers and soul-friends. In ways both tangible and not, I will bring so many with me when I go…and leave behind much, as is always the way when a magical link is broken. Next up, then, reflections on the trees I loved first and perhaps best of all – Trembling aspen and Balsam poplar. And then, pheobes, avens, catbirds, snapping turtles, bur oak and silver maple, white ash and saw-whet owls, and foxes who come to the house to die. 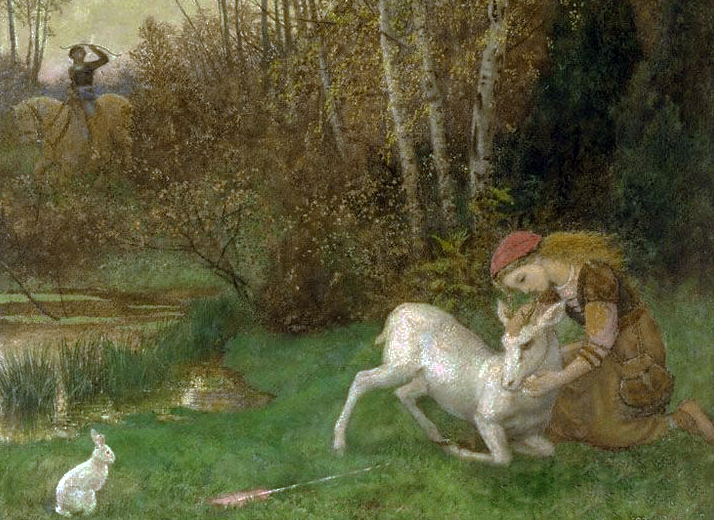 Rose beads and hyssop, apple runes and mugwort…mockingbirds, orioles…and always, the deer. This afternoon I took a break to spend time with my sorrow, the fresh and the old – long experience tells me this is necessary, and that ignoring it will only lead to fatigue, apathy and a need to keep distracted all the time…instead of a nap, which I allow myself on very tough days, I read a little from Francis Weller’s The Wild Edge of Sorrow, which arrived yesterday. Almost right away I felt myself wandering in shadow, through not only this recent loss but so many others – humans and other animals I have loved and lost, the tragedy of my father dying without reconciliation, the tragedy of me ever thinking it was possible we would – losing our home (we have to move next year) breaking of ties with two of my best friends last year, and the larger framework of what is happening all over the world (the first thing that greeted me when I sat down to write, was a horror story about elephant abuse, how does anyone stay sane with it all?) ….but, the time spent in contemplation of and connection with sorrow is time well spent. I am thinking of course about Amidala, who died almost two weeks ago, suddenly, and who has left a scar on my heart that I cannot describe. The empty space on the sofa where she always lay, invited me to remember her, actually sense her impression, her spirit, as I read. 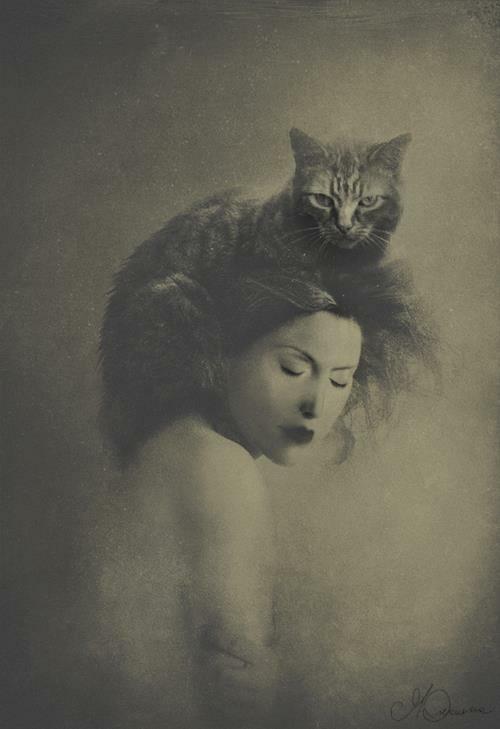 Her physical being is gone, and my final memory will be her beautiful tail and one little foot sticking out from under my shawl, the one I chose to wrap and bury her in..lifeless. Yet here she is, in absence, still here in spirit.Close by me as I read, once again, about how to manage the loss of a friend I had cherished and adored…and lost. 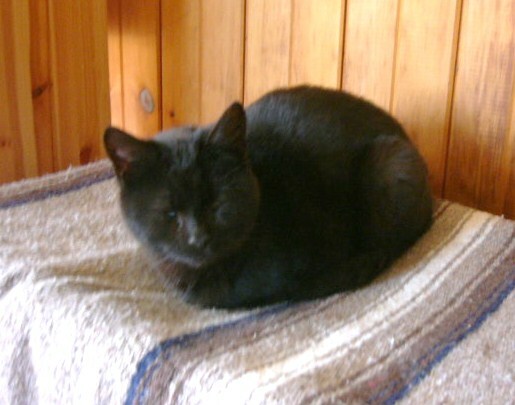 And suddenly I remembered The Bat – a tiny, bright-eyed, super-inquisitive and cheerful little black cat that the House Viking rescued and brought home, years ago….an outstandingly clever and sweet- tempered little spirit. After only a few months here, she began to show breathing problems, worse and worse, and when it became clear we had to take her in, the diagnosis was advanced heart failure – she would drown in lung fluid, if untreated, and if treated would not have more than a few weeks or even days anyway. We opted to let her go, that day, rather than extend suffering and delay the inevitable. Alone with her in the examining room, I felt myself flood with pain as she watched the birds outside, so excited and bright, even as she struggled to breathe and the fluid in her lungs rattled with every attempt. 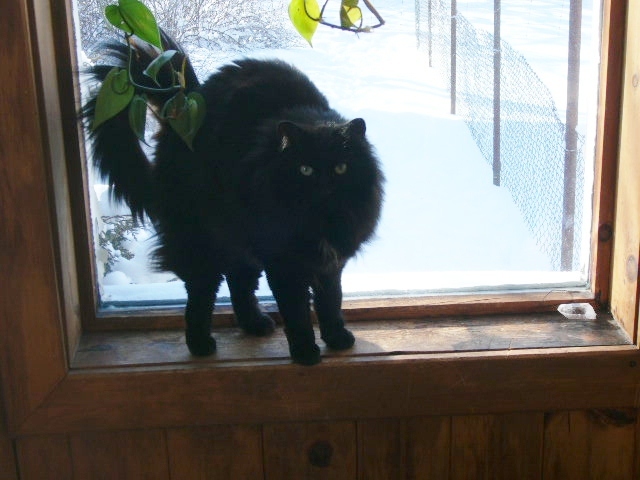 I sat quietly and watched the enormous light in this cat, not more than a year old, and I held her as the needle went in, and she looked up at the vet as if to say..”what’s this, then?”…just as she would when I brought in herbs, or opened the fridge door, or carried groceries into the house. Always curious – sweet to the core, and gone so soon. It was that visit, that awful day, that brought zhouzhou to me a few weeks later- had I not gone into theclinic with Batia, and spent so long there, waiting for Xrays and making the decision, I wouldn’t have chatted with the receptionist, told her how I do a little cat rescue, how we came to have our various animals, and she wouldn’t have had my number to call a few weeks later when zhouzhou and her brother were brought in to be PTS, as no one had any time or love for them at all. 6 years later, zhouzhou is content here and so well loved – the cycle turns and one precious friend is lost, and in time, another one comes – not to replace, but to balance your pain with joy and happiness, again. Opening Wheeler’s book, I read the quote from Terry Tempest Williams – “Grief dares us to love once more”. When we love other species, and are fated to lose them over and over, this dare becomes a challenge it is tempting to ignore. But I won’t ignore it. I am just sick with the loss of Amidala, whom I’ve written about on Facebook and will ultimately write more about here, as I can. Just “pain-saturated”, I am right now. But the time will come to welcome another, and there is always this ocean of love for those that are here, and on a larger scale, all animals everywhere (with all the pain that brings). Now; whatever you believe, I have deep feelings about life and death, and beyond the universality of suffering, we all have our gnosis. After I spent the time I needed with book and pain and quiet opening, I got up to start tea and finish the work of the day, in my office. Strangely silent here with Korky resting and all the furbearers too lethargic to be making commotion, I sat down and started opening my Files. Within a minute, off to my left, a rustle, and a familiar (no pun intended) sensation of chill and awareness. I quickly realized the time – Amidala’s time, the hour of day she always jumped on the desk to my left and demanded attention. I sat looking at the empty space, frozen, really – and out of nowhere, a whole stack of client files fell over, covering the emptiness. It is a completely still day, not the whisper of a breeze. I looked at all the work to be done and realized, work is both my salvation and my mission, and also the thing that takes me away from what I cherish. I remembered all the times I REALLY wanted to get something done, and there she was, wanting to play, hard to resist but still “inconvenient “. Sitting here today, files all over the desk, I felt the Hand of the Unseen, all through and around me. Loss and hope, pain and gratitude. As grieving well will always bring. So now, I get to work. On this client case I am almost through – and on the much harder task of staying soft, and open, in the grey silence of sorrow. With the presence of absence close by, and the inevitable ache of having loved a vulnerable little being, with all of one’s heart. 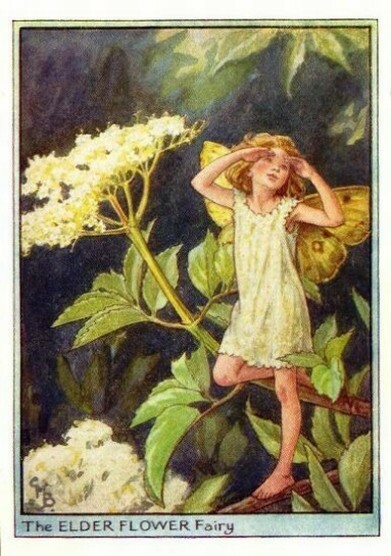 Till we meet again, my faerie. Till we all, all of us, meet again. In this week of global pain and sorrow, with shootings in Paris and bombings in Beirut and around the world, I’ve found refuge not in the forest but in my work. Mostly that’s because I have no choice – an extra heavy workload just arrived and needed to get done, and I found solace in it. For years the only thing that could heal my spirit was the forest, but this past two weeks has been deer hunting season here in the Hills and I’ve felt compelled to stay indoors more than usual. I suppose you could say, if I have to have an almost unmanageable pile of work, this is the best time of year for it. I don’t really feel safe anyway, in the woods, even with all the neon orange I an find on both me and the dogs. Not all hunters are crazy, but some are, and that minority will shoot at anything that moves. So, I got another humungus article done for Plant Healer magazine, I took on an urgent case on top of an already fully booked week, I coped with the shopping/cleaning/cooking etc that all falls on me, while Alex is away. I even managed to get through my latest learning adventure, an online Nutrition Intensive with the great Thomas Easley (of the Eclectic School of Herbal Medicine). I’m tired – really bonedeep tired – but I’m doing ok.
Then, the attack in Paris. I have a dear friend in Paris, and the first thought for me was, oh God, Marc and family!! They are safe, but the world is shaken by the depths of evil that masterminded this slaughter of innocents. I put up a French flag in support, and offered my prayers, only to see FB connections slam those of us who posted in support of France, when so many other atrocities have taken place recently. ..and again, I found myself castigated for praying, as though” religion” was the very thing that caused this situation, not human evil using religion as its vessel. It’s been a tiring week, between my own small struggles and the world at large. I feel as though I can’t take refuge anywhere – well, this past two weeks, I couldn’t, anyway. Once the dust settles in this impossible-to-maintain Old House, I’ll get back in balance, but I’ve felt the weight of the world on me even at the same time I keep reminding myself, how good I really have it. A paradox, but one to keep in mind and heart together. So. No forest access, way too much work, heart-wrenching world crises exacerbated by bickering in the Internet. Night before last, just before dusk (which is, horribly, about 4:30 right now) I was carrying some leftovers out to the field for ravens, head down, watching the path in front of me, probably muttering away to myself as I went. 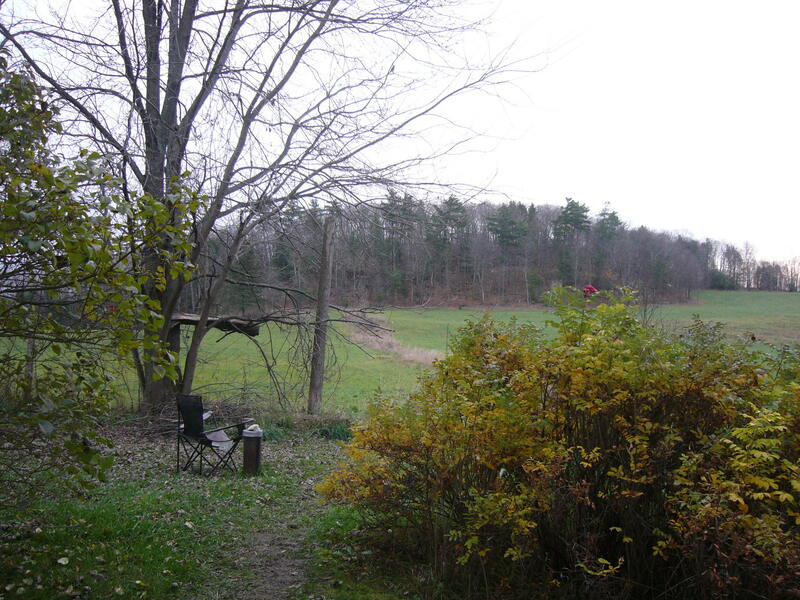 I headed out the back door and up the path towards the large open back field where this time last year, I fed deer every day, watched them cavort by moonlight, fell in love with the White-tail in such a big way I was ordering books, reading their stories, learning their ways and of course, naming them all. Here are a few of them, November 2014. 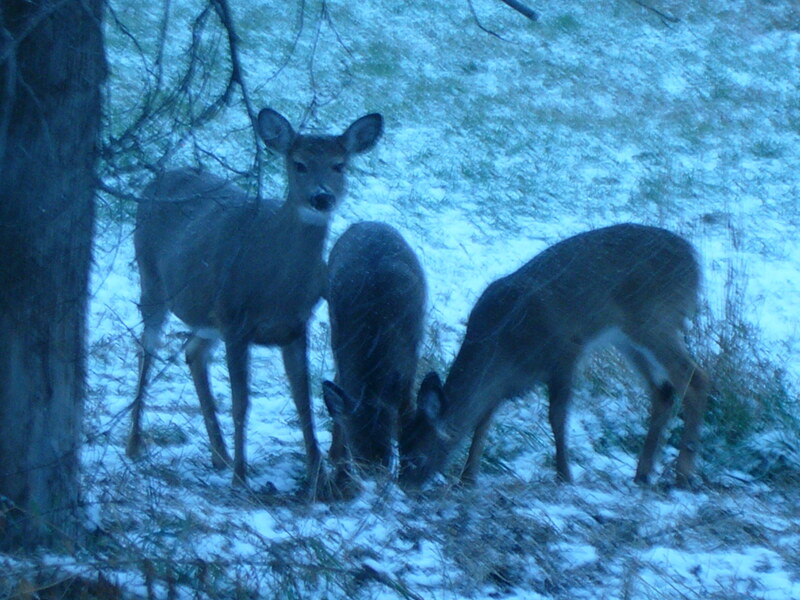 Sorry about the weird colouring – the one on the left is Goat-doe, and her two fawns Salix and Tilia. Left to right, that’s Stripey-doe, Goat-doe, Tulsi, Salix and Clarissa. I love these creatures with an intensity I don’t have the words to describe. They are magical, each one with a unique personality, spirit and presence. 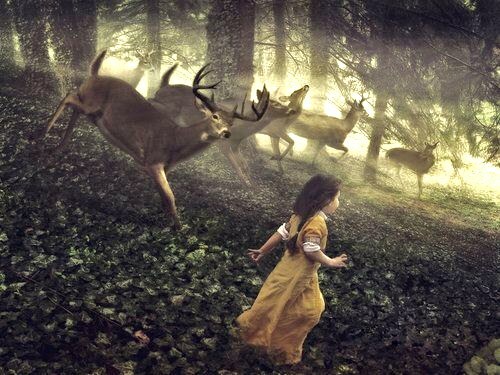 I run with them in my dreams, I sing to them in the depth of winter, I keep the link from their wild hearts to mine, strong and alive. And this autumn just past, they were conspicuously missing, all of them. I would see one doe far up the hill, with her fawn; one magical morning I stepped out of my shower to see another doe with two smaller fawns, foraging in the mist as the sun rose behind my house. I wasn’t sure who it was, maybe Clarissa. 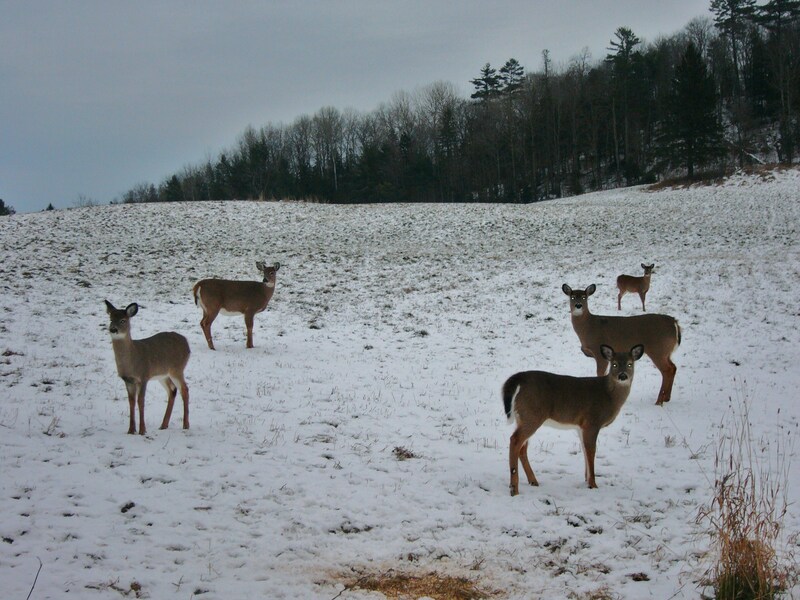 But the herd, who slept under my cedars, ate all the herbs and pooped all over the garden, who stamped their feet for bread and apples every twilight – nowhere to be seen this year. I have missed them, but I understand nature. They died over the winter, were shot by hunters, or taken down by wolves. I get that. I try to keep my heart safe and realistic. But I missed them – and just a few days ago I was thinking, as I watched the furtive doe on the hill, how sad it was that I would probably never see them again, especially Goat-doe. The unmistakable, broad of head, direct of stare, feisty, and very curious Goat- doe. 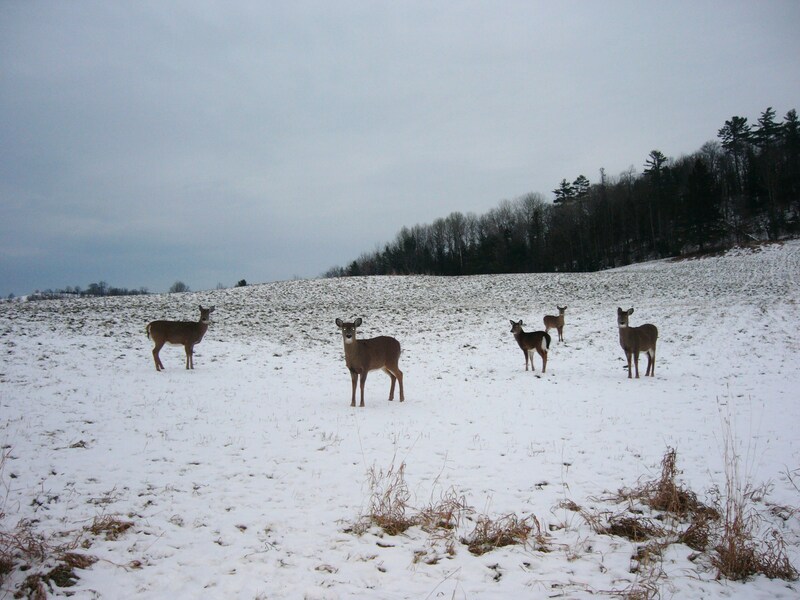 Of all these deer, the one that held my heart most tightly. The one I felt most bonded to, most affinity for.. and never to see her again! That is nature – but it’s also hard. I spent a moment by the rowans, feeling that loss with all of my heart. So now, hunting season is past and we are headed into a mild winter, and she and her baby are fine. As the world outside of this little corner of mine explodes with pain and rage and suffering, I am delighted and comforted by the presence of a doe. My heart SINGS to see them (they are out there feeding now) and when I am weakened, faltering, defeated – they help me stay strong. The “beauty of the green earth, and white moon amongst the stars” shines in them and through them, and I am pulled back from my present-day fear into the child I once was, beyond excitement at the chance to see a wallaby at my father’s college…or stop and rescue a stray turtle from the road. No small thing, these beautiful meetings, this twilight rendezvous, this sweet and potent – untainted -joy. I will take every moment I can get. Walking in the woods with a dog can have it’s drawbacks, if you are there mostly to listen and attune. Dogs see/sense/smell everything long before we do and they can be a distraction, albeit a lovely one. Other times, they can amaze us with their powerful Sixth Sense, and be sources of wild inspiration. Today I pulled into the lot where I leave my car when Dan and I wander into Faerieland, a common practise – but as soon as he got out every nerve and fiber of his being was just crackling with energy. Silly human, me – I was ambling along feeling just tired and self -focused,eager to embrace the forest’s healing presence – thinking, thinking, thinking. While Dan usually shuffles along a few feet away, sniffing about and thoroughly enjoying the fresh air, today he was immediately on high alert – RAN out of the car like he’d seen a fox, all his short hair standing up along his back- a sure sign of something afoot – magic? Stoned kids, or deer… all I knew was, something was going on and I perked up a little to take extra note. “The environment in which your hawk is found will tell you much about how its energies are likely to manifest within your life.” Of course, this is true of any encounter! But today – where are we? a liminal space, between my mundane life and the depths of the forest, that sometimes dark, sometimes cheery, but always seductive place where everything falls away and a spiderweb can intrigue me for hours, were death is just another entrance and where time has little meaning…the hawk says to me.. what? Choose? Integrate? Go home and sleep?I never jump to conclusions, but take it in and ruminate a while (the Cow, after all, is my Helper Animal for this challenging year, so I will chew on this a while). It is a startling and obviously significant event. Meanwhile, Danny has vanished. So I bid the Hawk adieu (he seemed annoyed) and follow my dog. At once the uneasy stillness of this familiar woodland hits me. It is SILENT, utterly – not a cricket, chickadee or distant automobile, and the silence is all-encompassing and palpably strange. As we go deeper (Danny finally caught up) the stillness grows more intense. Something is speaking, and still don’t know what it was .I’m just honoured to have heard the Voice of Whatever That Actually Was. And isn’t that ok, really, to be baffled, touched and mystified, to just Ask rather than Know? Isn’t, perhaps, being drawn back to Mystery and Awe the whole point? When a daily jaunt can become a moment of depth and magic, when a common bird can stop you in your tracks, and your regular waking trail transform into a place out of time and space, isn’t wonder and humility the obvious response rather than assumption and immediate “gnosis?” I am thinking about so many things today – where this path takes me next, how to integrate the diverging strands of my life, what needs to be sacrificed and what tended and nurtured. 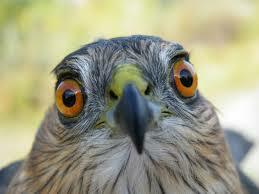 The eerie forest energy, the insistent hawk, the striking canine awareness mirroring my own – all Gateways, not endings. When we look up some meanings on the net or in books and promptly decide what a thing “meant” we so often get stuck in ego, and in thinking the point is to figure it all out, asap, too.I think that totally misses the point! I think,too – for what it’s worth – these events and experiences just take us further into the labyrinth, open us to exploration and yes, danger. (but it is equally dangerous to ignore,I believe) I truly think that all we have to do is pay attention, and carry our questions forward. Today, quite out of nowhere, I am powerfully reminded of that. This one day seminar will cover a lot of ground! In four parts, here’s what we’re going to look at. Nutrition is one of the absolute cornerstones of good health, in terms of disease prevention and management of many conditions common to dog and cats. Today, with all the conflicting information and schools of thought, it can be extremely confusing for the devoted pet lover to know who to trust and how to choose the best diet possible for their beloved dog or cat. My philosophy is both simple and comprehensive; an optimal diet meets the following requirements – all three. 2) The best quality foods , preferably from local/organic sources, should always be used. 3) The macronutrient levels (that’s fat, protein and carbohydrate) and the foods selected should suit the individual – all dogs are not the same. Home made diets can, and often do, fall down in one or more of these categories. How is the average person to know if a home made diet is “balanced and complete?” Lastly, a look at some of the most popular myths – about digestion, veggies, “superfoods” and more. In this section, we’ll take a look at the most popular herbs in commerce right now and how to use them, but how also to select bioregional herbs (your own backyard!) to help with a range of common complaints (from atopy to UTI). I’ll explain the critically important difference between using herbs as “natural” substitutes for drugs, and the art of selection and individualizing your formulations. We’ll close with my own top 15 (or so) herbs for dogs and cats, herbs other than the popular and often over-used ones you may already be using. Here we go into the concrete steps you can take to build an optimal home prepared protocol, geared specifically to your own dog or cat? How do we ensure the Three Steps – meeting requirements, utilizing optimal foods and working with individuality are all addressed? We’ll take a deeper look at the nutrients dogs require, which foods provide them – when and how to supplement – and generally, how to optimize a home made diet. Since not everyone can feed home prepared diet, we can also talk about how to select a commercial food if that’s your preference, and what you can do to enhance it. Adding herbs and supplements other than the requirements(vitamins and minerals) can also be a minefield – we’ll look at categories of herbs and supplements and how to select, dose and administer them. In the last section of the day, I’ll take questions about the information covered, and about specific cases as well. There is much opinion masqueraded as fact in the world of natural health, and even hysteria – I present a balanced, informed and choice-centered approach to working with each animal and their human in a respectful way and expansive way. You’ll come away with a deeper knowledge of the science – and plenty of classnotes – I hope,too, a vision of natural health as not a strict type of diet to be slavishly adhered to, but a way of thinking and working with individuals, food and herbs, that is flexible, scientific, and leads to deeper study and understanding. Vegetarian lunch and refreshments are included. HOW TO REGISTER: All you do is use this link http://www.thepossiblecanine.com/product/diet-plan-for-a-healthy-dog and state in your payment form that it is for the seminar. I will issue your Registration forms right away, and confirm your spot. For any more information, don’t hesitate to email me at catlane@thepossiblecanine.com. So difficult to believe it’s been 5 or 6 weeks since I posted here. This summer really did get away from me – and my sense of it is, to many others as well. Between the weird weather and my partner’s prolonged absence, I just didn’t have quite the summer I was expecting. Class attendance dropped way off, the walks were cancelled due to weather, mostly, or my intermittent health issues (exhaustion) – my small but cherished herb garden, despite valiant efforts on my part to get burdock dug and raised beds weeded and mulched, just grew out of hand, to the point where even looking at it left me overwhelmed. That’s ok. I’m pretty good at switching gears when need be, and there were, as it turned out, some important aspects to focus on in a summer of too much work, and some personal disappointment as well. First – calendula. Everyone who grows herbs knows how cheerful, generous and incredibly useful calendula is.This summer was no exception – my organic seeds from Horizon Herbs sprang up eagerly and grew into 5 very large, very productive plants. Just yesterday I brought about 200 heads in to dry for winter use, and needless to say I have seeds galore. I planted my calendula too close to the borage this year and so I had these two behemoth species competing with each other, and since I use far more calendula than borage, guess who won out. But I left the massive, sprawling borage up as long as I could for the bees. It always cheered up a tedious afternoon to visit that part of the garden and see it alive, just swarming with bees. I didn’t actually make great use of borage, but I will always grow it, for that reason. In the wild overgrown sprawl that used to be my garden, several things happened naturally that I, working literally dawn to dusk 7 days a week, could not address, so I just watched. (The old Serenity Prayer in action!) The first few weeks I did some weeding every day, and then around Week Six I pulled a muscle in my chest wall and had to stop, while it healed (what a week THAT was!) As the summer wore on, with several calamities (sick dogs, beloved cat killed, falling out with two of the people I considered to be my closest friends, Alex’s absence, household issues) there just was really no time to make significant inroads into the garden at all. 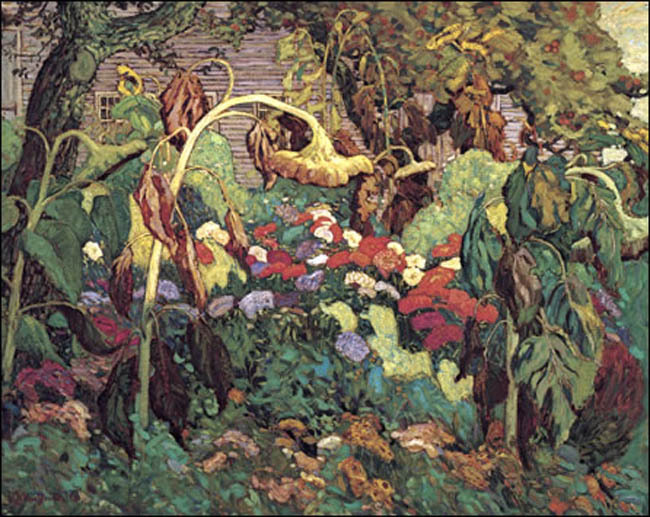 I’d go out and snip some hyssop, take in some sage, pop the flowerheads from the calendula and that was about all. I am intensely proud of having got through this summer at all, so the overgrown garden has not bothered me as much as I initially felt it would. Besides, there came some interesting ideas, from the tangle. The first important idea, to me anyway, was a kind of mirroring of much that is going on in my inner life. In addition to the clients I see weekly and the four courses I teach online, I also write for both PlantHealer magazine and herbmentor.com, endeavours that take almost a full work-week out of my monthly work-hours. I try to be available for my various facebook groups, and – here’s the World of Crazy now – I am taking four courses related to herbalism, and one that does not, so five in total. What this basically means is, without any hope of getting everything done, I have a wild garden in my head – filled with much of value but disorganized and out of control. This all stems from a fervent desire to be the best at what I do, to deepen my knowledge and expand the ways in which I can help animals (and humans!) to both heal and to learn about plant medicine and the power of nutrition. Those are fine and honorable goals. But just as my garden grew out of control and some of my most valued plants were choked out, we humans need to focus on keeping things orderly in our own lives, and when that is impossible, when things become crazy, take some time to assess what went wrong, and just breathe with the reality of what IS. The other thing is, we can benefit from a clear focus on what emerges as bright and strong. In the tangle of my mind this summer, several strands emerged as critical to my future serenity, one of which is limitation (powerfully reinforced in the Heavens as I reach my second Saturn return – Saturn, for those not astrologically inclined, rules over limitations, which sounds pretty bad, but as it leads to refinement of purpose, it’s actually very empowering). I’m weeding my personal life ( I hate the term “toxic people’ but there is a place for it, and several of those have had to go) weeding my commitments (I could have written BOTH my book and thesis with time I’ve given away for free this year) and last but not least, weeding my tangled garden.A slow and painful process, but overdue, and so through the blur of this summer, the broken friendships and the loss of illusionary hopes and yep, the veritable thicket of Cleaver’s, chicory and goosegrass that took over my garden, there emerge some core truths to be nurtured, some focal points to be focused on, some tenacious plants to be listened to and cherished. Calendula, the great vulnerary healer of tissues both inside and out, clearer-out of toxins, restorer of good cheer, heads the list. So, going forward, I have quarts of calendula blossoms in various carriers, I have tincture and several liters of dried flowerheads for both internal and external use as needed. I got the idea from Juliet Blankespoor, of adding calendula flowers to stocks and soups over the winter, so I always make sure I have plenty dried and ready to go. Calendula soothes the surfaces, reminding us that pain which seems superficial and transient, can in fact open gateways into the core of one’s being, so pay attention to those sore places, be they visible, like a rash on the skin, or hidden, like a hyperpermeable gut. The toxins need strong barriers to keep them out, the system needs to be kept whole and harmonious. 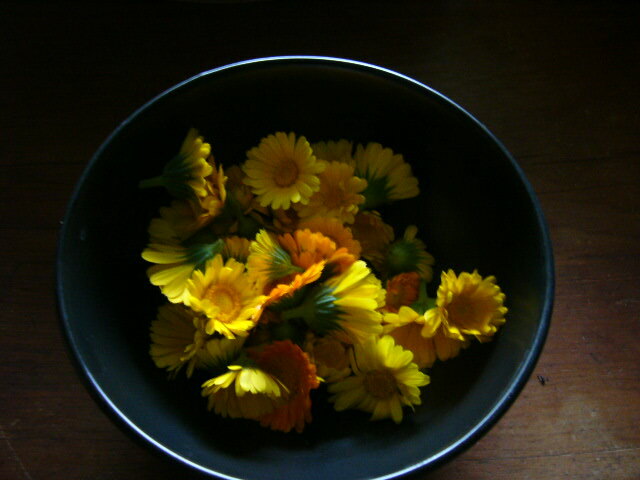 Calendula is one of those herbs that is so wellknown, ubiquitous even, that it can be easy to take for granted. I will say that her presence this summer kept my heart light at the darkest times, and her medicine has moved beyond the application of salve to skin and into that mystical realm where the plant is actually teaching me something about myself, about this moment in time. That what is needed is focus…soothing the rough places where old and new pain has rubbed me raw…and building barriers to keep the good stuff inside whole and healthy, and keep that which means me harm, away. Focus! and of course, good cheer, tenacity, and generosity. We should never let adversity make us small and mean-spirited, or we grant it a double victory. Thank you, calendula – and thank you, tangled garden. Even in my frustration with you, I have found peace. A very quick update today – class has been confirmed for this weekend, Sunday July 26, at 1:30 pm. Our theme will be “Actions and Energetics” – such an important topic for the aspiring herbalist. Whether you wish to use herbs and home remedies for your own family, or are looking to deepen your studies and work within the world of herbs professionally, this class is foundational knowledge. In it, we will go through the sometimes confusing world of herbal actions, take a look at the many actions just one plant can provide, and introduce the idea of synergy and complementary actions in formulation. We’ll look at Energetics – an overview of three systems, and how we in the Western tradition can start experiencing herbal energetics in our own bodies, and come to know the importance of matching the herb’s own pattern of temperature and moisture with that of an individual. Fluency in this area takes years of work and dedication, but this Introduction will set you on a road of discovery with clarity and purpose. This class will open your way of seeing herbs and people and enhance your selection process with the insights all herbalists use n our process. Plus, we’ll be tasting things and having fun. (Class is taught in English only). Not a herbal post today… not a happy post. This one can get filed in,a new category called “Tiredness”: I am tired of my empathy, tired of “humanity” and sick in my heart about a sweet faced, unassuming little spiny creature hacked to pieces by a farmer today. Porcupette, little one. I hate that you had to live in this world. I hate that I knew you were going to die. Most of all, right now, I hate that black hearted farmer. I’m not in a good place. We humans, we have to do better. And, I despair, at the same time I summon all the hope I can. The farmer started the hay harvest today and he plowed right over the little fellow I was talking with yesterday. Yesterday: I was sitting out back, talking to Alex on the phone, getting my bit of VitaminD. Watching the birds and sky. Circle of cats, Ridgeback at my side. The back field was half-cut; on the left, the cut side, a movement of something black and thoughtful. Not a runner, not a cat. Lumbering, a little. Too small for a fisher, and they never come out in mid day. A skunk? “Hold on” I say to my partner “I think there’s a skunk out there. I’ll call you back”. Danny knows the second I see, or think I see, something moving out back. It’s uncanny how I can raise the binos fifty times to look at a bird, and he never bats an eyelash. The second I see a fox, a coyote, a deer, he’s on his feet with all the fur around his ridge standing up, every muscle and nerve just crackling. He did that yesterday. I had to disappoint him, and head out to the field on my own. There he was. 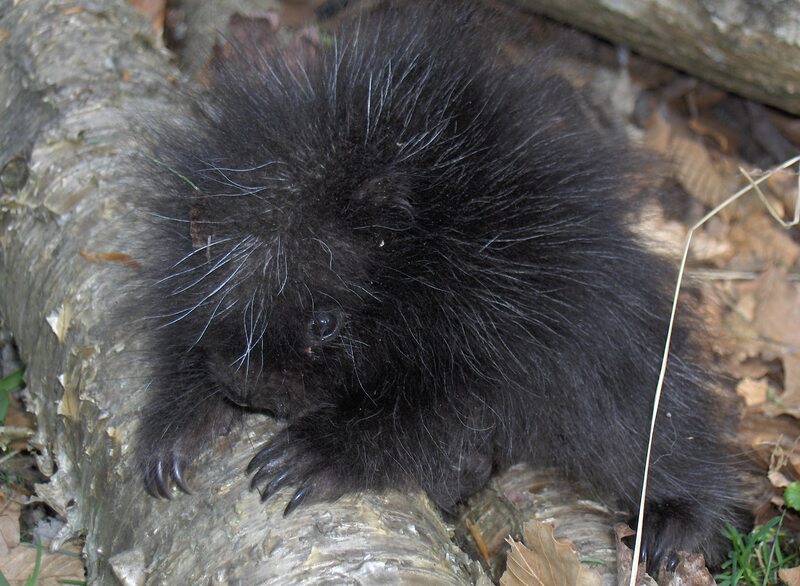 A young porcupine, a “porcupette”. Ambling, lazily, delighted in the day. He stood up and eyed me, not without consternation, but no evidence of panic. 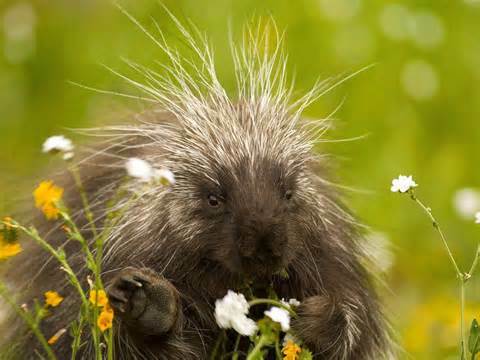 “Hey” I said, affably “Porcupine. I am so pleased to meet you. Can I ask, that you don’t go into that yard there? It never ends well, I have three big canids.” I was struck by how beautiful this fellow was, cute, yes but beautiful too, a wild creature at ease with the world, eating, sniffing, exploring it all. After a few more minutes of a somewhat one-sided conversation, he decided the only way I was going to stop talking, and let him enjoy the day, was if he headed off in the other direction. Which he did. I came in, and immediately posted to a forum I run. I wished I’d had my camera, but I didn’t think he would still be there if I ran back out and I didn’t want to chase or worry him. I found a picture that looked like him. Here it is. And then the darkness overtook me and I had such a terrible premonition. I had to shake myself out of it – no no no no no. I was shaken up, but told myself as I sometimes will, not to trust the “irrational” – it’s my fear talking. But, I know those flashes. I know them well. An hour later the farmer came out to cut the rest of the field and my heart literally shook in my chest. I knew, right then, what was about to happen. And of course, no way to stop it. No way at all. He cut the field, and I tried to calm myself with passionflower and chamomile and roses, wishing I had some Monotropa. One’s heart can only take so much. It seems we are surrounded with suffering in the animal kingdom, is this a trial by fire I must endure? As soon as the cutting was over, I went out. I followed the turkey vultures who are quick to land and spread their wings in a show of ownership of the find. It’s ok, they are necessary and important.But I HAD to walk that hill and find it: the pathetic, mutilated body of my little friend, with his unassuming ways, sweet face and abundant delight in life. One thing I take away from these observations (I have found groundhogs before, and last year, most horribly for me, a fawn) is that even the elimination of meat from our diets will not ensure that animals do not suffer at our hands. If one small field can beget such suffering, think of the whole agricultural world. Countless millions of small wild animals and ground nesting birds die horribly every year. Limiting or eliminating meat and dairy is great, if you can do it – but so important to grow food, buy locally, support small operations….we humans are doing things wrong, doing things all centered on and geared toward growth and profit and exploitation, and these innocent creatures will suffer. Not *just* in our laboratories and factory farms and in legholds everywhere, but in the fields that produce our grains and hay. A true spiritual species would never allow any of this to occur. And what can we do? well, for today, I will just light a candle and say a prayer – for all the animals slaughtered and suffering at our merciless, blind and selfish hands. As a Pagan, I turn to Brigid, often, for solace and support, spiritual guidance and healing. Just yesterday, a writer I admire posted a prayer to Brigid on her blog. And these lines seem especially applicable. Pour out the quenching waters from your well. Come, bathe our tear stained faces. We call to you with voices raised. I think I will adapt this as a prayer to Flidais, in memory of, my porcupette…and all the days he will not know. Little porcupette, I will never forget you. Once again I have the lovely and talented Caroline Citrine to thank for this great poster – which I finally managed to distribute around Wakefield. I am so looking forward to class this weekend, getting together with my core group of students, maybe seeing some new faces, and having fun with the process of creating usable medicines from our beloved wild and cultivated herbs. Medicine-making is a large topic, and I don’t expect everyone to master it in a day, much less a two and a half hour class. But as we get started, there are some things we need to bear in mind – some is a little technical (which plant constituents extract best in which medium, for example) and most is just learning techniques to try at home. I’ve been doing this for a while and still have failures, still learn (endlessly) from others, still find new ways of doing old things, that improve upon the end result. I’m inspired by the creativity of others, inspired to try new combinations – for example, my many elixirs now brewing in the back of the cupbaord which feature combinations I doubt I’d have come up with on my own (tip of the hat to mountainrose herbs!) In this class, we will start by covering the basic terms, and methods of preparation. This includes – tea, infusion, decoction – what’s the difference? – tinctures, how to measure your plant material and use of alcohol – various approaches – oxymels, elixirs, ointments, salves, compresses, poultices, fomentations, electuaries, capsules, pessaries, syrups, honeys and vinegars – a look at all of these, how to make and when to use them..and then in the second part of class, we’ll make a few/taste a few, and generally have fun. This will be an Introductory class but very thorough and plenty of handouts(terms, recipes) at the Facebook group for you to download. 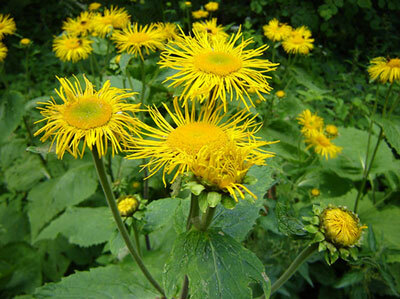 I’ll be bringing dandelions for tea and dandelion cookies (cuz it’s that time of year!) and have some seedlings to give away mostly borage, calendula, some monarda and chamomile(German) too. Looking forward to seeing you all – 1:30 pm at the Rupert Community Centre – and to our walk next time ,which we shall all petition the rain gods to stay well away from!! A little later than I’d hoped – here are the class dates and topics. 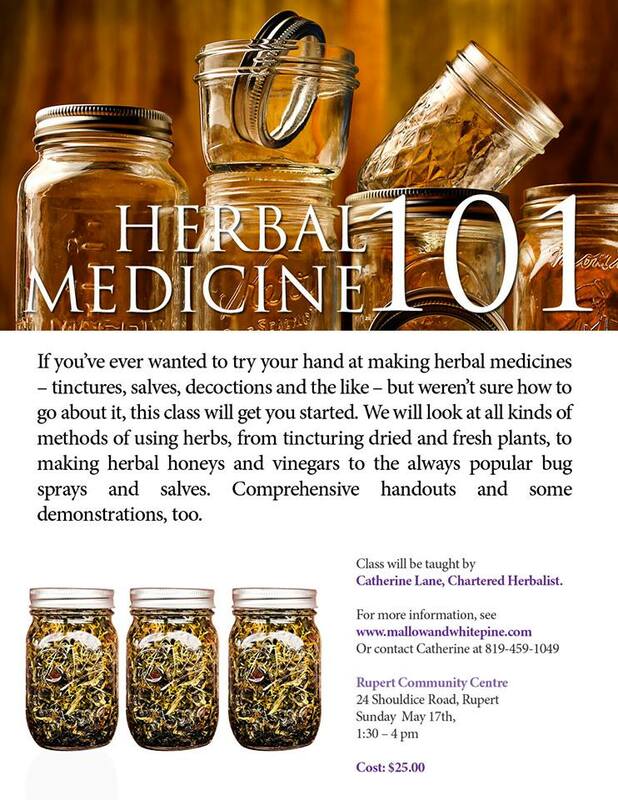 May 17th – Medicine Making 101 – oils, salves, tinctures and more. These walks will visit the same plants in different stages of growth, as well as go to various areas to see a range of wild herbs and hone our ID skills. I’ll post a list of what you will need here as well as on the FB group, so everyone can be well prepared. You will need some materials for the medicine making class, and I’ll be sure to post that as well before the date. For the most part, we will meet at the Rupert Community Centre as for the classes. I’m looking at doing a fullday workshop towards the end of the year where we review all our studies this year, make medicines with the plants we’ve harvested(roots, in particular) and review our herbal apothecary for the coming winter. More on that TBA.